Many events are commemorated in the production of decorative glassware and ceramics. As a nation of sports enthusiasts, there is a bountiful array of sporting themed pieces of ceramics and glassware. They range from 19th century stirrup cups and glasses engraved and decorated with a huntsman on horse back or similar theme, to the more modern Beswick porcelain models of horses and champion breeds of cattle and dogs. 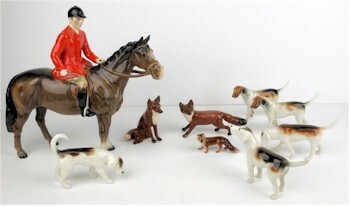 Ever popular, one of the most desirable is the complete set of Beswick figures of huntsman and hound in pursuit of the hapless fox. 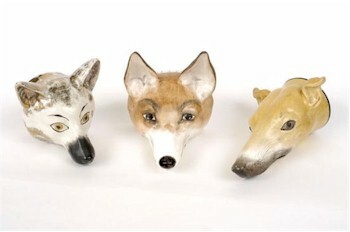 A part-suite of hunting-themed drinking glasses, which were offered in the ceramics and glassware section of a Sporting auction and fetched £500. A group of Beswick hunting figures. Royal Doulton is particularly known for the production of a number of sporting pieces in the late 19th century with such themes as cricket, cycling and golf. These were often tumblers or cups with sprigged decoration, made by Royal Doulton as the popularity of these sports increased. 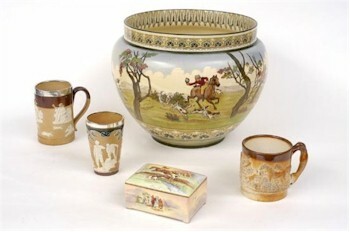 A group of Royal Doulton sporting themed ceramics. Majolica game tureens decorated with hares, ducks and wildfowl served as a reminder and a celebration of the dinner made from the day's catch. Made by many factories in the late 19th century, the most popular examples are those by Wedgewood and George Jones. These majolica game tureens are well modelled and highly coloured, regularly achieving £250-£300 at auction. 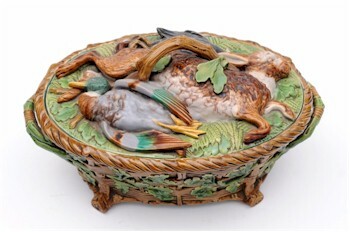 A typical Majolica game tureen and cover. Such pieces regularly achieve £250-£300 in the ceramics and glassware section of our Sporting auctions. 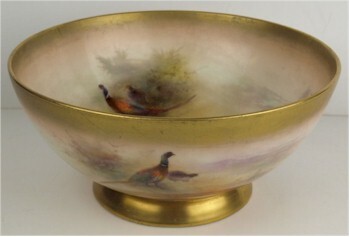 A Royal Worcester porcelain bowl with pheasant decoration by James Stinton, which sold for £310 in the ceramics and glass section of a Sporting sale. Royal Worcester is probably the best known factory for the quality of the pieces produced by Harry Stinton and James Stinton. Produced around the turn of the century, they are skilfully hand-painted with pheasant, sheep and cattle landscape scenes. Royal Worcester produced pieces in many sizes from large vases to tea cups and saucers with decoration by James Stinton. Prices range from £200 for a small bowl to £1,500 for a vase with decoration by James Stinton. Three 19th century Staffordshire stirrup cups, typical of the hunting-related ceramics that are offered in our Sporting sales.